Bimetallic steam traps contain a valve that is opened and closed by the differential expansion of metallic disks. Bimetallic steam traps are used in many industrial and commercial applications in the chemical processing, energy production, food processing, HVAC, pulp and paper, mining, petro-chemical and pharmaceutical industries. Here is a video that illustrates how a bimetallic steam trap works. It shows the thermostatic principal involved and how two bimetallic plates interact and provide physical movement to open and close a valve seat to discharge condensate. In nature, the laws of physics will continually drive energy in an attempt to reach equilibrium. 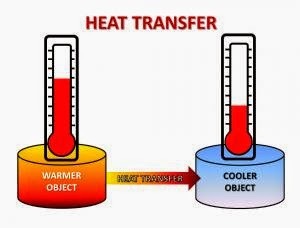 In a thermal loop, as long as there is a temperature difference, heat moves away from the warmer entity to the cooler entity. Heat exchangers facilitate this phenomena with tube bundles and vessels which separates the hot medium from the cold. Heat penetrates the surface of the tubes and is transferred to the contents of the vessel, thereby heating or cooling fluids or gases in the vessel or in the tubes. A wafer check valve is an excellent choice for applications where water hammer, mounting space and flow restriction are issues. 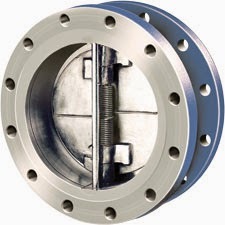 A wafer check is designed to be "sandwiched" inline between two pipe flanges in the piping system, adding very little additional weight or bulk to the piping layout. Wafer checks overall tend to be stronger, lighter, smaller, more efficient and less expensive than conventional swing check valves and are easier to install between standard gasket and line flanges. Disc travel is short with less impact force caused by valve closing. The disc closes quickly with less water hammer pressure. 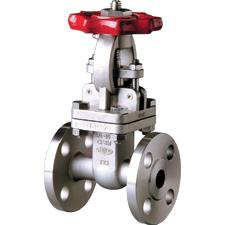 Water hammer pressure is only 1/2 to 1/5 times of flange type swing check valve and flange type lift check valve. Horizontal and vertical installation available. Very low opening (cracking) pressure differential. More reliable due to lower impact forces, less water hammer. Wafer check valves are available in many sizes, typically from 2” to 72”, in ASME pressure classes 125 through 2500 and API 6A and 6D pressure classes. DIN, JIS, BS, AS, and ISO standards are also available. Body styles include wafer, lug, double flanged and extended body. Wafer check configurations are available in retainer-less style, wafer, extended body wafer and lined. Typical body materials are cast iron, ductile iron, WCB cast steel, 316 stainless steel and other alloys. Common seating materials are EPDM, Buna-N, Neoprene, Refrigeration-grade elastomer, and Viton. The most common end connections are raised face, plain face, ring joint, weld-end, as well as hub-end. steel, sizes up to 48”, both wafer and lugged body styles available, in pressures classes 150 – 600. Here is a short video introducing the Flowseal high performance butterfly valve. The term “exothermic” describes a reaction or process that releases energy, usually in the form of heat. In chemical processing and manufacturing, controlling the heat created by an exothermic reactions is critical to preserve quality, production and safety. 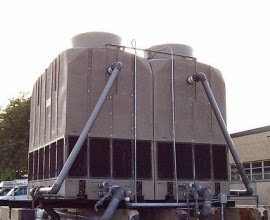 A common way to remove heat is the use of a cooling tower. Cooling water is circulated through the industrial process via pipes or tubes to extract heat, and then passes through a cooling tower to remove the heat so it can then be recirculated back to the process. Many exothermic reactions occur when mixing harsh compounds or chemicals. These harsh chemicals have a negative impact on the performance of the process equipment handling the reaction. The equipment is also exposed to vapors and contaminants in the surrounding atmosphere. Metallic structures are the most prone to attack and corrosion. When a cooling tower is needed in a corrosive or harsh environment, metal framed cooling towers with metal walls should be avoided. Instead, cooling towers with seamless, double wall plastic (HDPE) shells, corrosion proof construction, PVC piping and water distribution systems and totally enclosed motors are recommended. Sample industries where plastic cooling towers are used in harsh environments are water treatment, waste water treatment, pulp and paper processing, primary metals processing, plating, and corrosive chemical production.